Summary: When the centuries-barren orchards of Berrie-on-the-Wyn suddenly bear fruit, it is clear that something strange is afoot — and something fey, for this is no ordinary harvest. To partake of the fruits of Faerie is to be changed for good, but not necessarily for the better. From whence come the golden apples, the moonlit silver pears? Who is the motley piper who walks the streets of Berrie, drawing forth magic and mayhem with his music? And how can half of the town vanish into thin air? I had a good impression of Charlotte English, having previously read another book of hers, and so I went into this with anticipation, and she certainly delivers! 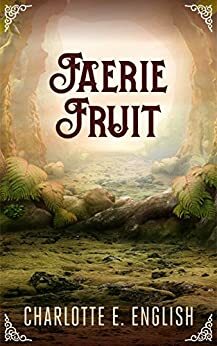 Faerie Fruit is a fantasy, though there was some romance between one of the couples in the book. Mainly, the way it's written, we are presented with a mystery when the book opens. In Berrie Wyn, fruit trees are barren and withered. Orchards lay bare. For so long, maybe a hundred years, it has been so. Until one day, a golden apple was found on the branch of a tree in Carimond's orchard. Then a pear, then a peach, etc on other trees. What's curious is that the fruit, when ingested, has the ability to change the person's character to the opposite of what it currently is. For example, Carimond's mother is a miser, but when she partook of the fruit, she became most generous. It appears to be good…until it was bad. Moreover, houses start disappearing…into mists. What's happening? From different characters' perspectives, we piece together the mystery and the tragedy. It's a fantastic tale that the author has drawn us into, and I cannot help but flip the pages frantically to know what's going to happen next. From the title, you can surmise that the story has something to do with faerie, and it's a story I hadn't read before. Quite original and unusual. My only regret is that I took so long to dive into this. Recommended to readers who love faeries, mysteries and fantasy.